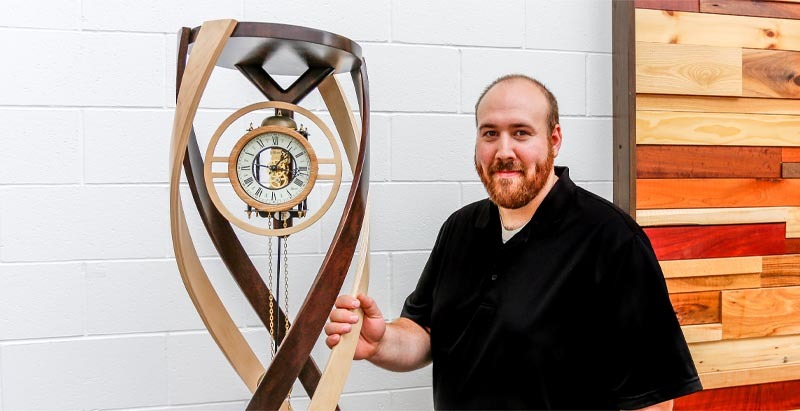 Andrew Shortt and his DNA Clock, which took 130 hours to build. Andrew Shortt was the winner of Conestoga College’s annual showcase at the Doon Campus. On Aug. 16, second-year students in Conestoga’s Woodworking Technology (co-op) program presented projects at the Woodworking Centre’s semi-annual showcase. Faculty member Steve Bader, welcomed students, families and friends, faculty, and industry partners to the popular event. More than a dozen student projects were judged on a broad range of skills, and pieces on display included everything from clocks, chairs, cabinetry and even a kitchen island. Bader thanked attendees and congratulated students on their excellent work and dedication and acknowledged the efforts that went into producing the pieces. Projects were judged by both current and retired woodworking faculty and based on product design and development, craftsmanship, and product presentation. Andrew Shortt spent 130 hours completing his winning entry, the DNA clock, which earned him first place and $750. Shortt said he will use the money to pay bills he incurred buying supplies for his clock. Second place and $500 went to Andrew Whitbread for his kitchen island and Mike Hendrickson earned third place and $250 for his cherry chest of drawers. Students will start their co-op turn after the summer break and return to the college for the final semester in January. 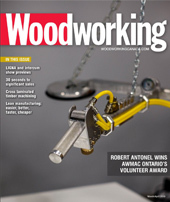 Conestoga’s Woodworking Centre of Ontario is a 50,000 square foot facility that began in 1988 and has grown to become the largest woodworking training centre in North America.